So you've got your walls painted, furniture picked out and curtains hung, but what about the blank walls? 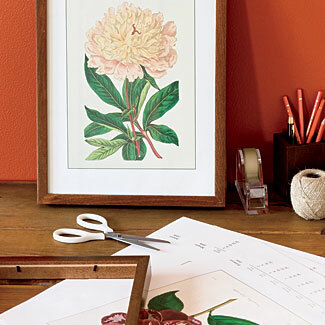 One of the biggest elements in completing a room is artwork. And not just any artwork. Like anything else in design, there is good and bad artwork. But if you want your room to have a polished, designer look, you need to stay away from bad. As you may have guessed, most of the bad comes from the home decor stores. You know...the prints that are made to look like oil paintings on canvas but obviously aren't originals? The florals, the posters shrink wrapped up in cardboard, or the cappuccino signs or pictures of a street in France. The subjects themselves aren't bad, but the way they are made is. I've said it before, and I'll say it again. Don't buy something, in this case to adorn your walls, that comes in bulk and is seen everywhere. The only look you will achieve is one of a staged apartment that is made to appear so generic that anyone could see themselves living in it. Well I don't know about you, but the last time I checked, generic was not the look I was going for. "Well what do you suggest I put up, then?" You have many options from which to choose. And believe it or not, they don't come with huge price tags. 1. Personal photographs. 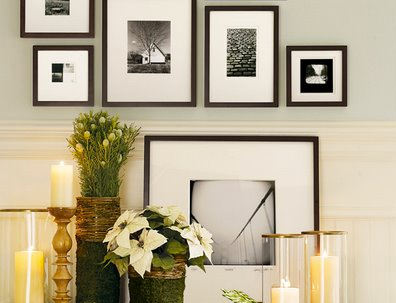 Displayed in the right frames, your own photos can make a great impact on any room. And you can bet that it is something you won't find anywhere else. It can be anything from family family portraits to scenery shots you took on your latest vacation. One way to give your photos a more professional look is increase their size and/or give them all the same look whether it be sepia or black and white. And have fun with it! Because the hubby and I we will be moving around a lot in the future, I plan to take a shot of all our house numbers and something of importance to us in the town to document where we've lived. I will add to the collection each time we move. It'll be free artwork and a wall of memories. 2. Initial Art. This is one of the easiest way to create your own artwork. Search through different fonts online or on your computer of the first letter of your last name and find one you like. Blow it up, mat it, frame it, and you're done. 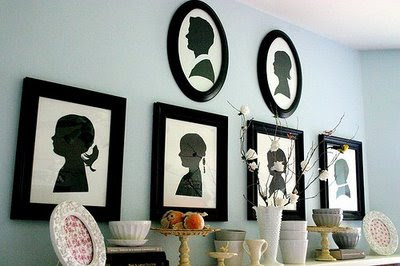 These especially look good in wall collages or a cluster of photos on the wall. 3. Silhouettes. These are timeless. 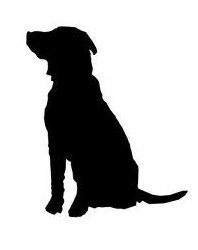 You can make a silhouette out of just about anything: nature, your family, even your pets. And if you want to give it a little more contemporary look, change out the typical black image for a fun pop of color or a pattern. Make one of you and your spouse when you were young and put it next to your profiles of today. There are several services (especially on etsy.com) that can make these for you or you could even do it yourself. The silhouette DIY process is simple. 1. Take a profile shot of your subject. 2. Cut out the entire background around it, keeping as detailed as possible. 3. Trace the cutout onto the piece of paper (usually the thicker, the better) you want for your image and cut it out. 4. Post it on your desired background (white, colored, patterned). 4. Paint your own. Depending on the look you're going for, you can probably paint something yourself. Hobby Lobby has sales on their canvases and acrylic paints all the time, and it doesn't take much imagination to make a contemporary piece. If canvases seem too scary for you, pick up a pad of bristol paper and get more for your money. You won't have to worry about messing up or ruining a canvas because if you make a mistake can just tear off that sheet and start again. Charcoal, pencils, watercolor, ink...you decide. 5. Books and calendars. Find a vintage book or calendar featuring a set of images you like (botanicals, nautical prints, buildings, etc.) and tear out a few pieces to frame. 6. Typography. Look for interesting drop letters in magazine articles that begin with your initial and take that page to your local copy store to have it blow up. Add a mat and frame and you have cheap, personalized artwork that is sure to be a conversation starter.